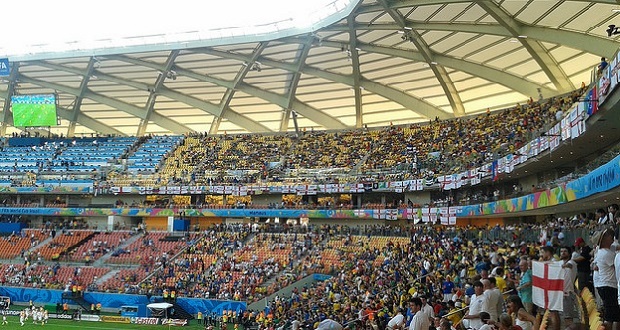 The US$270 million Arena da Amazônia was built for the 2014 World Cup in Manaus. Four World Cup qualifying group stage games were played in the 44,000 seater stadium. Manaus does not have a team in the top Brazilian league. Football is a simple game. Twenty-two men chase a ball for 90 minutes and at the end the Germans always win, or so said Gary Lineker, the popular TV commentator and former England international. He was wrong. Football, in fact, is a system that benefits a small group of people by exploring the passion and emotions of millions around the world. This is the reality that was built by officials for the last 40 years, with the complicity of politicians, dictators, presidents, companies and TV networks. I write regularly about the darker side of football and have exposed how over the years football has become a way on enriching an oligarchy: the possibility of buying a World Cup, commercial deals, the construction of stadia, the choice of referees, results on the pitch, ticketing, TV rights and even the ball. What the US FBI triggered last May in Zurich, by requesting the arrest of seven football officials, was the downfall of an empire constructed outside of the legal system by a group of people that self-declared their monopoly over the game. One by one, men who believed they had the same immunities as heads of state, were arrested, jailed and are now being extradited to face charges in the US. With documents and interviews, I have demonstrated how every single World Cup since 1998 is under suspicion of corruption. In 2014 in Brazil, the most important sports event on the planet left a sour taste for Brazilians. Loosing 7:1 to Germany was, actually, the least of the humiliations Brazilian citizens went through. The real legacy is the always-evident white elephant stadiums from Brasília to Manaus; the financial albatross hanging around the neck of even the famous Rio de Janeiro Maracana; and the kickbacks and subsequent arrests and police raids at the local government offices in Natal, Recife and Salvador where games were played. And then there is also the story of Odebrecht (which is also implicated in the Petrobras scandal rocking the Brazilian government today), the construction giant that allegedly ‘won’ almost all the building contracts. It was no surprise that even the “football nation” took to the streets against the World Cup in Brazil. The trouble is once the World Cup circus has left town, the world focus moves on. Now it’s all about Russia and Qatar. Brazil? That was yesterday’s game for the rest of the world, while Brazilians are left to count the victims and an estimated debt of over US$7.5 billion. My investigations also point out how the Brazilian Confederation of Football hijacked the national team and its emblematic yellow shirt. By a number of contracts signed with companies in off-shore centres, those at the top of Brazilian football deviated millions of dollars from every friendly game played by the team. There is also evidence that the same Confederation signed a commercial deal giving the private sector rights to determine which players would be called for a match. The Brazilian team was, in fact, sold. But I am not against football. I want a call to action, an exposure of the under-world that controls the beautiful game. Fans should not be only present in a stadium but also play a role, above all, as citizens in order to assure that the most democratic sport maintains its popular character. They should demand that their clubs hire great players, but also that they publish their balance sheets, explain how tenders are done and vote for those in top jobs who will ensure transparency, and not simply go after titles at any costs.